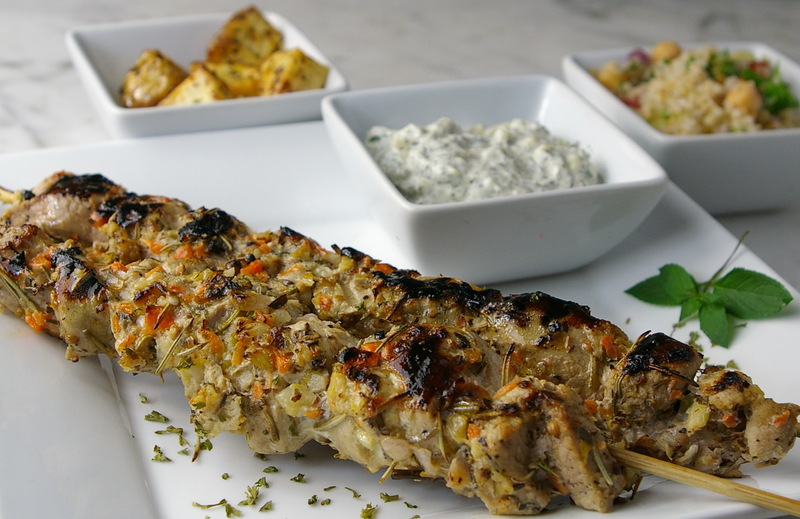 Souvlaki is a popular Greek fast food, consisting of small pieces of meat and sometimes vegetables grilled on a skewer. It may be served on the skewer for eating out of hand or in pita sandwiches, or plated with roasted potatoes. The meat is usually pork, but may be made with other types of meat such as chicken, lamb, beef, or fish. Cut the meat into small cubes. In a bowl, mix the marinade ingredients well and add the meat, mix again, cover and leave to marinate for 24-48 hours in the refrigerator. I like to use a ziplock back placed in a shallow container or bowl, takes up less room in the fridge. When you are ready to cook it , take bamboo skewers that have soaked in some water for about 15 minutes, or use metal skewers, and thread the meat on the skewers. Grill over medium hot grill , until done “Pork is considered done when it reaches an average interior temperature of 75.9°C (170°F).” You can also do this on an indoor grill without the skewers if you like. This entry was posted in Home, Pork, Recipe Index and tagged garlic, greek, grilling, lemon, marinade, meat, Pork by Ginger Smoothy and Otto Pilot. Bookmark the permalink. I eat this at a Greek festival in Monterey, CA every year. Love it! I think I could eat souvlaki every day of the year and never get tired of it. Thanks for the recipe. I’ve actually never tried it at home. Thank-you for commenting, I love it too. It goes really well in a pita too, or even on a pizza . It’s great stuff.